» NIL: Sendoff: PFC Morgan Huckbone Warriors' Watch Riders: WE HAVE YOUR BACKS AT HOME! 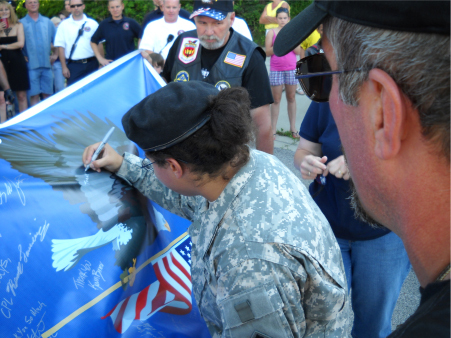 PFC Morgan Huckbone wanted to do something special with her life. She thought the United States Army was a good place to start. 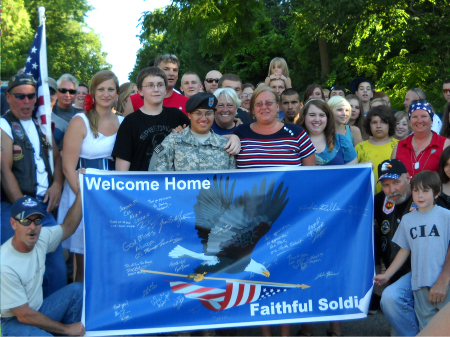 She joined the Army in October of 2009. Morgan completed Boot Camp Training at Fort Leonard Wood, Missouri. The Army gave her addition training at Fort Carson, Colorado. She will be leaving in July for her first tour of duty. Morgan has been assigned to a security detail that will be guarding a general in Afghanistan. 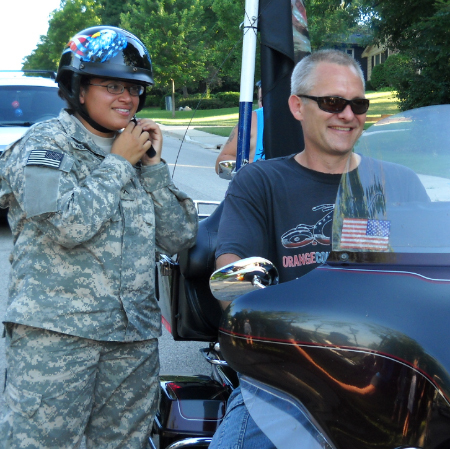 She told us that part of her MOS will include being a back-up to the Gunner on a Humvee. The WWR was invited by Morgans Uncle to give her a Send-off Meet n Greet. He said that the family and friends were having a send-off backyard barbecue and thought that this would be a great time to show our appreciation. We met at the staging area along with the Algonquin Fire and Police Departments. There were about 20 bikes and 6 cages. We were led by fire trucks and police cars with lights flashing and sirens blowing. When we turned the corner onto Morgans street, there were family and friends gathered outside. When we arrived, hugs, well wishes and thank yous were given to Morgan. 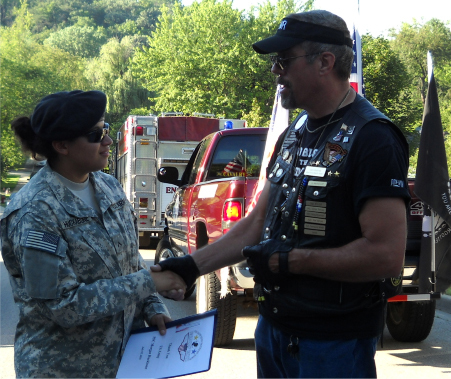 We presented her with a copy of the Welcome Home thread, the WWR challenge coin and honor beads. We had her sign our banner and then everyone gathered around for a group photo. Morgan had a request to take a short ride on the back of a motorcycle. That was a “no problem” request. There were plenty of motorcycles for her to choose from. We gave Morgan a helmet and told her to hop on. We all mounted up and escorted Morgan around town on her first motorcycle ride. We want to give a big thank you to the Algonquin Fire and Police Departments for escorting our group. To the family and friends of Morgan, thank you for letting us crash the party, and especially to PFC Morgan Huckbone for volunteering to protect our freedom. No user commented in " NIL: Sendoff: PFC Morgan Huckbone "